Can we take a minute to congratulate Lion Brand Yarns for their 140th year of yarn business?! That is truly such an AMAZING accomplishment and I'm so thrilled to be a part of that celebration by joining in their Christmas in July sale. Lion Brand Yarns is by far one of my favorite companies EVER. Their products are high quality, and working with any of their fiber is a complete dream. I’m a huge fan of their yarn line “Vanna’s Choice”. Its a soft and durable, medium weight yarn, that has great stitch definition and comes in a gorgeous color range. I design children-based crochet patterns, and being a parent myself, my main concern with making children’s clothing is to design long-lasting, high-quality garments, that are also fun and spark a child’s personality. Within the past year or so, I’ve been designing hat patterns that range from size newborn all the way up to adult size. I love working with Lion Brand yarn because I never worry about the quality of their products. I know that they will withstand a child's play, while keeping my hard work everlasting. On July 14th Lion Brand sent out an email with the title “Christmas Has Come Early With Some Mega Sales!”. I immediately stopped doing house chores and opened up the email because I mean…who doesn’t LOVE a great yarn sale?! 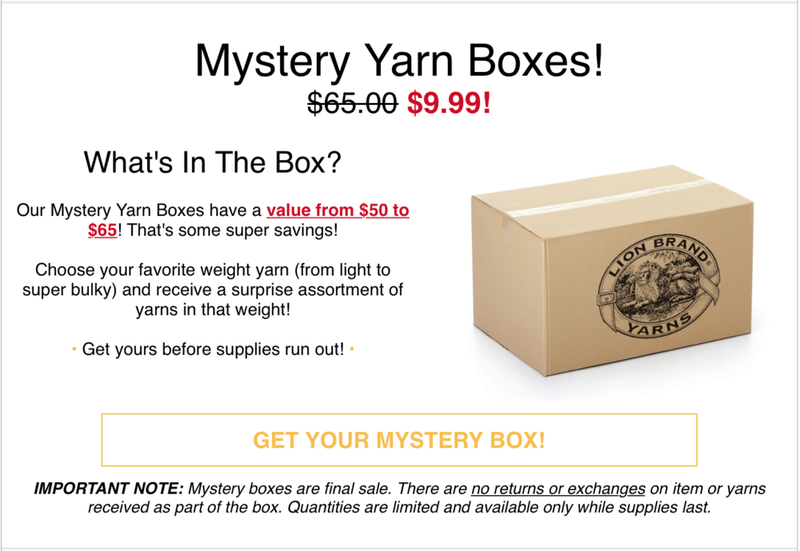 Within their email, I see “Mystery Yarn Boxes! $9.99”. So I popped on over to their site and I was blown away by their sale so much that I bought two boxes of worsted weight yarn without hesitation. I am not ashamed. A little about the Mystery Yarn Box: Each box contains 3 balls each of 3 different yarns, for a total of 9 skeins. You also get to choose what fiber weight you would like to be included. The box contents retail for a value of $50 to $60 worth of yarn but is on sale for $9.99! That means you’re getting high-quality, beautiful yarn for about $1 a skein! Holy Toledo! That is a “blow your mind” type of yarn sale! It was just too good of a deal to pass up and too good to keep it to myself, so I shared it online with my crochet community on Facebook and Instagram. I was happy to see so many other crafters order some boxes as well. No more waiting! Let’s see what goodies are hiding in these boxes. In the first box I received three skeins of “Heartland” in the shade “Denali”, three skeins of “Textures” in the shade “Desert Sands”, and three skeins of “Keppi” in the shade “Cotton Candy Pink”. In the second box I received three skeins of “Heartland” in the shade “Denali”, three skeins of “Shawl in a ball” in the shade “Peaceful Earth”, and three skeins of “Keppi” in the shade “Lollipop Yellow”. If you missed out on this sale, don’t worry! Lion Brand always has excellent deals. I highly recommend signing up for the newsletter subscription if you want to stay updated on Lion Brand’s sales and best prices. I also post any great deals I hear about on my Facebook page and Instagram account. I rarely sign up for things as I don’t like my mailbox to be overrun with emails, but there's a few websites, brands, and designers I follow at all times, and Lion Brand Yarns is definitely at the top of that list.